Jason and Julie, our beloved friends, our cherished family, are in dire need. We are asking for your generous help and for your financial support. Eight years of showing up to fight brain cancer comes with a cost and they have admirably paid that bill with fortitude and grit. This year has been particularly tough on Jason’s prognosis and medical bills are mounting. Let’s come together as a community to make sure Jason and Julie have all that they need to pay their bills and feed their souls so that their reserved energy is used squarely and substantively for the betterment of Jason’s health (for an abridged summary of his battle with cancer, see below). 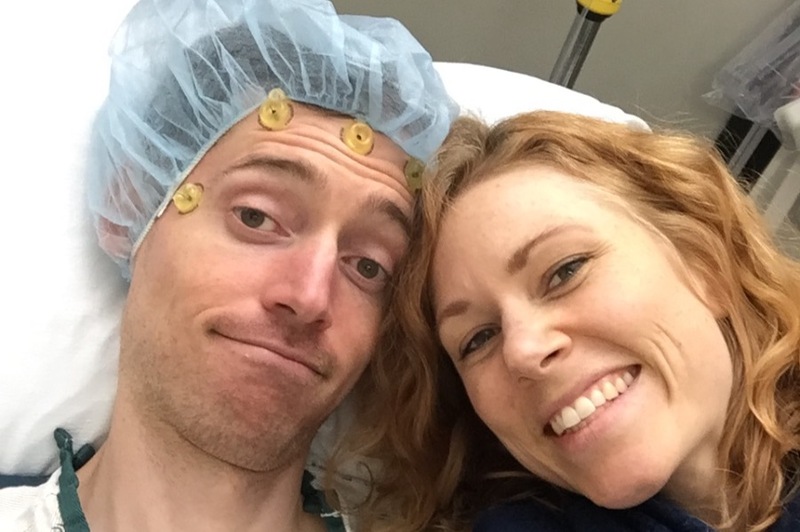 A few weeks ago Jason went in for his 5th surgery so the doctors could drain the water from his brain, drain a cyst that had formed, and take out and test any cancerous material they came across. Walking, talking, eating, and getting around are all difficult for Jason and he needs constant care and supervision. Julie is happily doing this but also working to provide for their needs for survival. All of this journey has been met with love, wit and humor from Jason and Julie. (Take a gander at his blog btw, and see for yourself. I’ll post the link below.) They are the first to help anyone and everyone in need. They are the real deal in this complicated world and two of the best friends this writer has ever had. We ask that you help out in any way you can. Donate money. Forward this page. Post on social media. Anything and everything is appreciated. In 2010, right smack in the holiday season, tests revealed an aggressively malignant tumor, the size of a lemon, cradling Jason’s brain. Brain surgeries 1 and 2 scraped the mass out and away from it’s point of origin, the cerebellum. Good thing is, between chemo, radiation and the invasive operations, the tumor was eradicated... as was much of Jason’s coordination. This all took place mere weeks after Jason had passed the California Bar Exam to become a lawyer. Needless to say, Julie and Jason became a one income household. Countless MRI’s led to 6 years of a cancer free head for Jason until, in the early summer of 2016 a small tumor was found near the same place in Jason’s brain. Another surgery, more chemo and radiation, and a year on a trial drug did reduce the growth in size to a mere dot, but did not completely eliminate it. For 2 years, the “dot” persisted. Then earlier this year (2018) another dot formed and so Jason endured yet another surgery (4 if you’re keeping track) and went on a new infusion drug. And that takes us up to last month. Every dollar goes directly towards Jason's recovery. We wanted to share an update on what's happening. Julie and Jason are completely overwhelmed by the outpouring of love, kindness and generosity. Julie cried. I've cried. Thank you for your messages and prayers. Thank you for sharing this page far and wide. And thank you for opening your wallets, especially during this holiday season. If you haven't already, please share on your social media platforms. Getting eyes on this page is the single most effective way of getting them the help they deserve.